Everytime I made this easy beef Bourguignon recipe while living in Paris my neighbor would want to know what was making the whole apartment building smell so good. 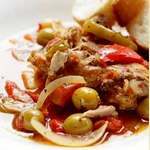 Like most stews, it is a great dish to make in the afternoon and leave simmering until dinnertime, enticing everyone to the table. 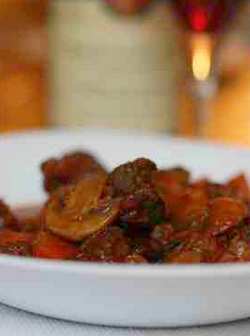 I usually make this beef Bourguignon recipe with a cheaper bottle of Bourgogne and serve it with a more expensive one, but you can make it with any low-tanin red wine you think would be nice. Most cooks advise using good wine to cook with, mais il ne faut pas exagérer. Lots of times you will find sauces thickened in France with something called a beurre manié, made by mixing softened butter with an equal amount of flour and a bit of cooking liquid. The beurre manié is added to the dish a few minutes before serving. I have left it as an optional step in this recipe. If you can afford the extra calories, go ahead with this addition, but you will get a very tasty and satisfying stew even if you leave it out. 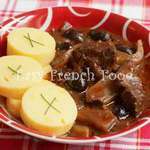 This is a very satisfying beef Bourguignon recipe and best served with something simple, perhaps steamed potatos or noodles. A mixed green salad would be good for an entree and something light for dessert (in season fruit is always a good healthy choice). You'll be pleased to find out that this beef Bourguignon recipe is even better tasting when served as leftovers the next day. In a large heavy pot or Dutch oven, cook the onions and carrots in the oil on medium heat until soft, about 8 minutes. Add the bacon and continue cooking and stirring for 8 minutes. Add the meat and cook, turning several times, until browned on all sides. Sprinkle the meat with salt and pepper. Add the herbs, the garlic and the red wine. Cover, turn down the heat, and let simmer for at least two hours. Meanwhile cook the mushrooms in the butter until soft and add to the stew after about two hours along with the tomato concentrate. Simmer until meat is very tender. Sometimes I cook it for the last hour without the lid to get a more concentrated sauce. If you are thickening your stew before serving, mix the butter and flour together in a small bowl until well blended. Blend in a tablespoon of the cooking liquid, and then stir this mixture back into the stew. Continue cooking for several minutes. 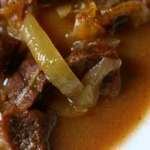 Return to Easy French Beef Recipes.